Paper Crafts by Candace: Shape/Slider Card Blog Hop! Welcome to our Shape/Slider Card blog hop! This hop will give you lots of inspiration and access to some totally awesome new files! And now for my project! I made a pineapple shape card. This Pineapple is NEW from SVG Cutting Files. I used my ink to distress the edges and the middle a little. I also used my orange pen to add some stitch marks. From Jaded Blossom I used the candy wrap and banner dies along with birthday candies 2. Totally cool Pineapple, so delicious look & love the die title. Great card shape! Love the idea for some sweet summer card ideas! this is so awesome!!! Its been a long time since I've had the chance to hop...so I don't know how recently you changed it but your blog design is absolutely adorable!!!! Love the pineapple!!!! Great card! Would have never thought to make a card from this..so cute! So cute..thanks for sharing your ideas! Very cute! I love the details and shading! Thanks for sharing your yummy pineapple shape card. I loVe how you added the highlights to it. They make the details pop. I just have to add... this reminded me of one of my all time favorite shows, Psych. It would be perfect to send to my Psych watching friends. Super cute--love the addition with the orange pen-- makes such a huge difference! This is a deliciously sweet card. Love the idea to use a pineapple for a birthday card. Awesome pineapple, I liked how you used the distress ink. Such a cute summer-y card! I really like your card....great work! Awesome and so fun for the summer! I love the distressed edges to! Love it and the stitching you added. This is great! I love the sequins! This pineapple is awesome! Just perfect for Hawaii! Your pineapple card is so cute! Cute. Great use of Distress Ink. Love your shaped card. The colors are awesome. 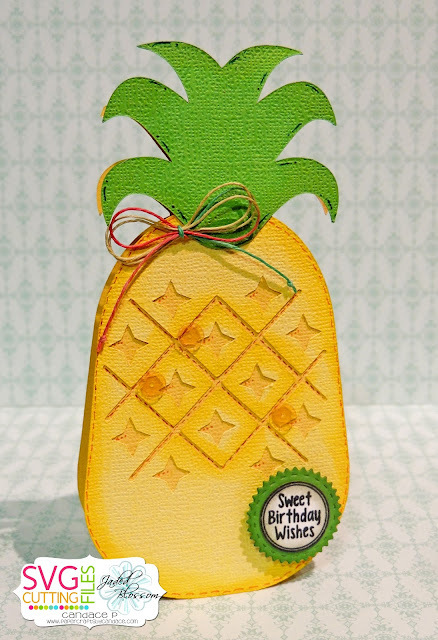 Love this pineapple shaped card! You did a great job shading and adding details with the stitch marks! Not sure what I would use it for, but cute. Maybe a card for travel to Hawaii??? This looks so good! Gave me an idea for our summer party invites! Love the pineapple....so in style. thanks for my birthday card ! I KNOW this is for me !!! Its so cute !!! love it chickie ! Great pineapple card. IT can be used for a variety of uses. Love pineapple, makes me want to go get one. What a darling summery card! Love this! Cery cute pineapple card, Candace! The stitch marks add so much. Great job! hehe, The card looks AMAZING!!! Very sweet--I like the ink distressing. Love the detail on the pineapple! My family in Hawaii would love this! Pineapples are so popular right now! This is very cute! Love the pineapple! Cool card! I love making shaped cards.. great job. This pineapple card is adorable!! !